NEW LOWER PRICE! FISH A LEGEND. Buddy Davis arguably made one of the best sport fishing boats ever built. The 47 Convertible one of the company's most popular models and you won't find a better head sea ride. Stylish lines, an abrupt broken shear and the unmistakable classic Carolina flare will certainly get the attention of onlookers. This 1986 Buddy Davis is in great condition, she was repowered in 2006 with Catepillar C15 engines that are barely broken in at 560 hours. At 850 horsepower each, these engines will give you all the speed you will need. 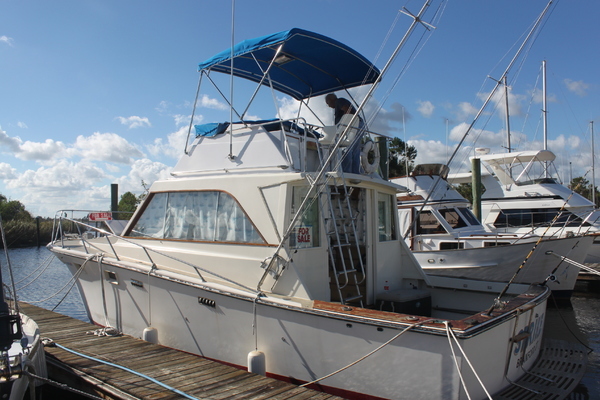 "My Island Lady" is in great shape, sleeps 5 comfortably and has two heads. The owner also had a new Cat generator installed and has replaced both air conditioning units. Her owner has regularly maintained the mechanicals as well as the cosmetics. The galley bar area has been removed, opening up the salon area and the electrical panel moved to the port side. If you're looking for a serious offshore fishing machine or just to sit back and cruise in style, this is the one! Entering through the cockpit door into the salon one finds a wide open area where the bar area to the galley has been removed. The breaker panel has been relocated from the previous bar area to the port side between the galley and salon seating. A large "L" shaped sofa is to port, another straight sofa to starboard. The galley is forward and to port of the main salon and a refrigerator and ice maker to starboard. Going forward is a berth to starboard in the passageway. Amidships to port is the main stateroom with a queensize berth and ensuite head. Forward and to starboard is a second head with separate shower. Foward is a double bunk to starboard and shelf and cabinetry to port. The 47 Davis has an elevated fly bridge with great visibilty 360 degrees. From the helm the operator can observe the forward portion of the foredeck and pulpit as well as the cockpit and stern. The Eisenglass is clear and in good condition. The helm has a traditional varnished teak base and stainless helm wheel. Forward of the helm is an electrically operated cabinet which houses the vessels radar and GPS unit. Overhead are two locking cabinets containing a VHF radio and other electronics. Forward the centerline helm is a large seating area with comfortable vinyl cushions.